Bluecoat 585 is used for exposing designs for flatbed machine screen in textile printing. This emulsion is used for half tone type sharp designs in textile printing. 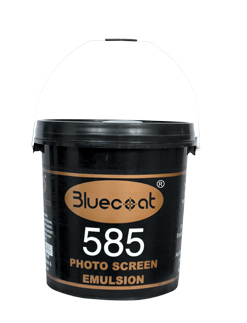 Photo image, efficiency, sharpness of the design, excellent run ability and mechanical strength are the outstanding features of Bluecoat 585 - Once the screen is exposed, it needs to be hardened with Bluecoat Hardener.